Communication with Affiliates is essential in creating a successful program and lasting business relationships. Newsletters are a great way to both engage and activate Affiliates in your program by providing them with program updates, website changes, selling tips, popular products, seasonal deals, new industry trends and sales incentives. When speaking with Merchants about the Newsletter feature, a few very popular questions are “What do I say?” or “What would the Affiliate want to receive?” The first step is to find INSPIRATION! Customer Behavior – I would say this is the easiest and one of the more effective methods because you already have the information! Take a look at the top sellers; what sells best overall, per season, for a specific Holiday or event. Adding information on customer behavior will keep the Newsletter relevant and assist Affiliates in promoting your program! Tip: When mentioning specific products, deals, or creatives in the newsletter, use the Macro feature to embed the creative with useable links for the Affiliate. Pop Culture – Did a celebrity wear a similar dress to one you sell, mention a like-product to your own? ADD IT! A well-known public figure using or talking about a similar product or category will draw Affiliate interest and might spark an idea for their content site. Trends – Stay up to date on what’s current in your niche and pass that along to Affiliates. For example, sports & fitness websites – what is a new workout trend for Summer? Maybe stand up paddleboarding, juice cleanse’s, specific outdoor workouts, etc. Press Releases – Inform the Affiliates if the company or products have been featured in any offline media such as news releases, blogs, magazine, newspaper, television show, etc. It’s good for Affiliates to know that your brand is something that is recognized and trusted within that circle. 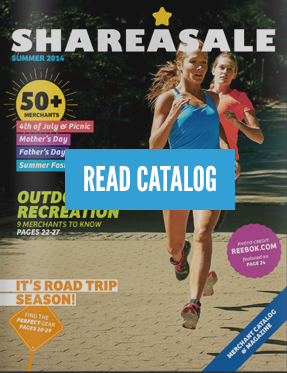 ShareASale Updates – Last but surely not least, keep up to date with the ShareASale blog on any new interface updates. Not only will it show Affiliates that you are active in the program, but will help build a relationship and add ease in Affiliates promoting your company or products. Personal Commission Rules – For example, this is one of the newer features on ShareASale. If you have implemented some new commission rules, communicate to Affiliates the special commission you are offering. Sarah uses the Shareist Bookmarklet to inspire her always creative ShareASale blog posts. Shareist is a platform to digitally capture ideas and web content into a Notebook to then share to your blogs as well as social networks. Shareist allows you to save notes in one place, collect content from the internet such as news articles, and share these with others! We use Shareist to organize our ShareASale blog collaborators, topics, and send one another content ideas. puts his "thinking cap" on when assisting over 95+ Merchants a month activate on the network. I would not necessary consider it a baseball cap, rather, a top hat – Honest Abe-esque? Very fitting for Chris. is inspired by all Chicago sports! Her inspiration is apparent here at the office from the Chicago Bears calendar on the wall, Chicago Cubs flag on her desk, and Blackhawks apparel. I’m sure Kristen will be all decked out in Blackhawks apparel today as Chicago will be celebrating the Stanley Cup win with a parade through the city! As Jason was an Affiliate before coming here to ShareASale, he is inspired by helping Affiliates succeed and educate on how to increase sales. Jason is actually taking his inspiration to a whole new level by hosting a series called ShareASale Eduation to help Affiliates build a website from the ground-up and monetize it. View the blog “ShareASale Eduation: How To Build Your Affiliate Site” for further information. Ping-Pong – No we do not have an employee named Ping-Pong (would be cool if we did), but many ShareASalers collaborate and brainstorm over a game or two in our lovely, fun-filled Rec Room.